Would Jesus call God Mother? Wasn’t he known for calling God Abba, that homely Aramaic form for “father”? Didn’t this peculiar foreign word find its way to early church prayers? And wasn’t it, in translation, encoded into the Lord’s Prayer and thus burned into Christian sub-consciousness? All of it is true. Jesus did call God Abba-Father. But he also used number of parables and metaphors and images, which portray God as woman, housewife, mother. In the parable of the rising yeast the role of a wife baking and providing for her household is clearly a role for God. Just imagine God in an apron kneading dough on her kitchen table! Similarly, in the parable of the lost coin, isn’t the woman’s role the one reserved for God? Now imagine God with a broom sweeping and cleaning around her home in search for a trundled-away coin? And even that famous non sequitur about a camel and a needle, might be a biting criticism of the Jewish Hellenistic plutocracy. It nevertheless also betrays familiarity with female chores and also hints of God threading a needle to repair the torn tapestry of the world. Thus, although we do not have any record of Jesus actually calling God "Ima" - Mother, there is, nevertheless, a strong circumstantial evidence for Jesus thinking and visualizing God also in a form of motherly figure. 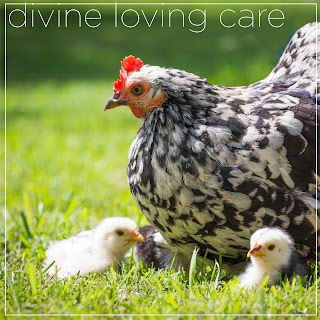 Come this Sunday to celebrate and rejoice in the motherly caring love of God. This Sunday we will again mark the birthday of Charles Darwin by celebrating Evolution Sunday. This tradition started in 2006 when religious leaders stood up to defend science teachers against attacks of the bible-belt fundamentalist evangelicals. The Rev. Dr. Byron Shafer enlisted Rutgers Church at the very beginning of this movement in 2006. 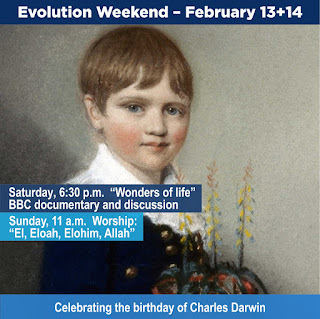 Then, during the interim period, the celebration was forgotten, and we returned to this worthy cause again in 2010 and Evolution Sunday has been observed at Rutgers Church ever since. After a few years we exhausted the theme of the relationship between religion and science and instead we proceeded a few steps further by applying the principal of evolution to religion and faith. Of course it required defining evolution a little more broadly than in the strictly Darwinian sense, as “gradual change of characteristics over period of time”. Last year, for instance we observed the evolution of Holy Communion from Biblical times throughout the medieval church history, the reformation, enlightenment rationalism, resurgent traditionalism until our postmodern times. This year we will apply evolutionary perspective to the name of God. Many Americans would be quite surprised to hear Aramaic and Arabic-speaking Christians (not Muslims!) ardently praying to Allah. What is going on? Is the Muslim God identical to Jewish or Christian one? In our rapidly globalizing society it is a burning question. Only last December Larycia Hawkins, a tenured political science professor at Wheaton College, was suspended and eventually last week expelled from the faculty, because she publicly stated that the God of Islam is the same as the Christian God. 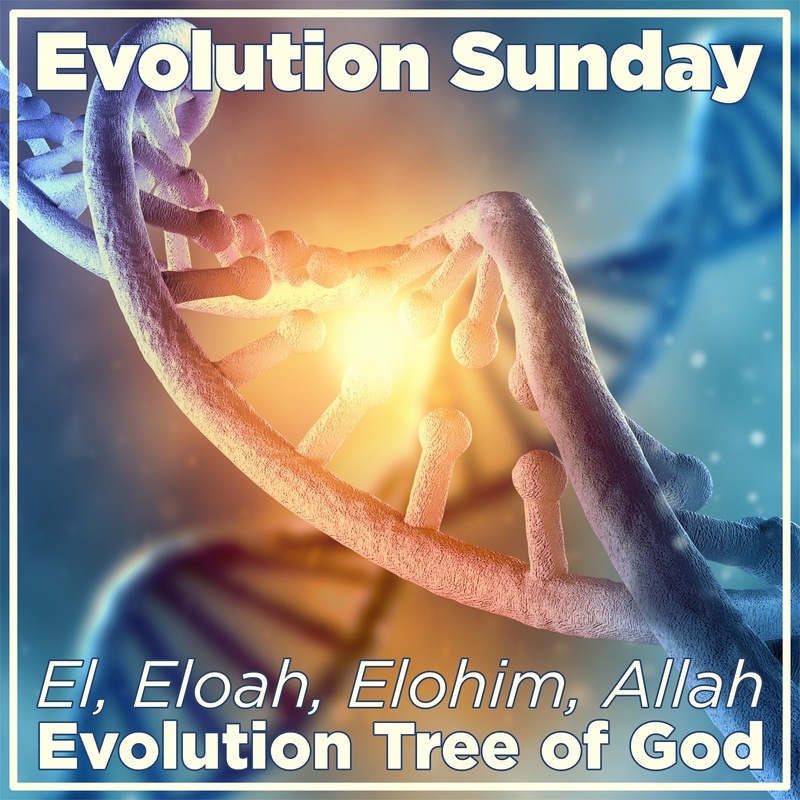 This Evolution Sunday we will apply this evolutionary perspective to the meaning and identity of the divine name. 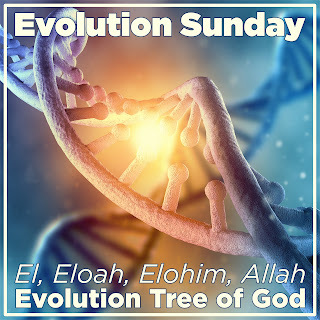 The evolution tree of the name of God will take us from the deepest recesses of polytheistic history through biblical Hebrew orthodoxy to our modern times and new developments. The issue is not simple, yet it will hopefully take us to deeper insights, to unfundamentalist faith and towards informed interfaith understanding. 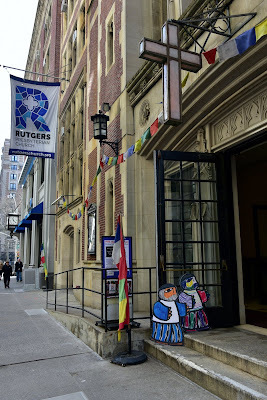 come to Rutgers worship this Sunday 2/7. Unfair Taxation - for me it will always be associated with Margaret Thatcher and her poll tax. In 1989 I received an invitation from the Church of Scotland to study theology for a year at the New College in Edinburgh. Shortly after I came to Scotland, the Berlin Wall came down and soon the totalitarian Communism was no more. Back in home I used to be part of a Christian youth movement strongly opposed to the totalitarian system and Margaret Thatcher was our hero. While the Velvet Revolution was going on in Prague, I went through my own political revolution because in Scotland I experienced first-hand the rigid harshness of conservative ideologues. Year 1989 was exactly the year when Thatcher imposed on Scotland her poll tax (to finance the local councils and infrastructure). She treated the Scots like guinea pigs, testing the poll tax in Scotland before it was to be introduced to the rest of the kingdom. From my meager bursary (British word for a scholarship) I paid a substantial poll tax prorated to finance Edinburgh City Council. This was a proper capitation tax when every person had to pay the same amount regardless of age, income or employment status and it was patently unfair! In respect of social ethos it was an attempt to return to dark and unjust medieval times. Around the world you can actually use an abolition of capitation as a marker of socially sensitive modernity. Of course I was in Scotland to study theology and I thought about it and reflected this experience through the theological prism. Jesus in the well-known passage about Roman Head Tax (Matthew 22:15-22) famously pronounced, “Give to emperor what caries his image and give to God what caries God’s image!” It can be further paraphrased: Pay tax even if it is unfair, because open rebellion is exactly what the state bureaucratic, police and judicial machineries are waiting for and are prepared to suppress and punish, but dedicate your entire self (Remember - you are the images of God!) to undo injustice and work for divine kingdom of SHALOM (God’s peace and harmony). So as I have mentioned, I dutifully paid the Thatcher’s poll tax because I did not want to be deported, but I went through substantial change of my heart and social orientation. I left Communist Prague for Great Britain as an ardent anticommunist and after experiencing the rule of Iron Lady over Scotland, I returned to my home, quickly returning to capitalism, and I was a theological democratic socialist - standing on the side and defending the oppressed, the exploited, the poor. Come this Sunday to meet with a notorious New Testament tax collector Zacchaeus (FlatZach) who similarly turned around his life. We will learn from Jesus why Flat Tax (just like head tax) is unfair and what we can do about it.